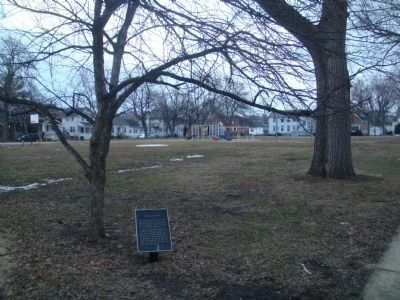 The first parcels of land for this park were acquired by the city of Madison in 1936 to create the "Milton Street Playground." Later, more land was purchased to expand the park. 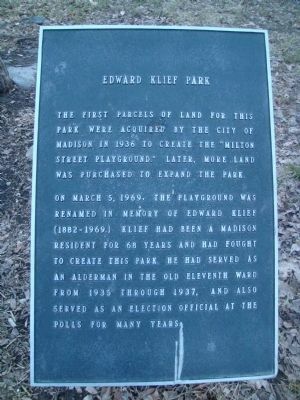 On March 5, 1969, the playground was renamed in memory of Edward Klief (1882-1969.) Klief had been a Madison resident for 68 years and had fought to create this park. He had served as an alderman in the old Eleventh Ward from 1935 through 1937, and also served as an election official at the polls for many years. Location. 43° 3.99′ N, 89° 24.432′ W. Marker is in Madison, Wisconsin, in Dane County. Marker is at the intersection of Milton Street and Orchard Street, on the right when traveling west on Milton Street. Touch for map. Marker is in this post office area: Madison WI 53715, United States of America. Touch for directions. The park is in the background. (approx. 0.3 miles away); Barry Alvarez (approx. 0.3 miles away); Pat Richter (approx. 0.3 miles away); Bear (approx. 0.3 miles away). Touch for a list and map of all markers in Madison. More. Search the internet for Edward Klief Park. Credits. This page was last revised on June 16, 2016. This page originally submitted on March 18, 2011, by William J. Toman of Green Lake, Wisconsin. This page has been viewed 490 times since then and 14 times this year. Photos: 1, 2. submitted on March 18, 2011, by William J. Toman of Green Lake, Wisconsin.